Undead Teds – “One of a kind zombie teddy bears.” These are gruesome little suckers. Cemetery Gun – Interesting old method for deterring grave robbers. Goth T-shirt – An amusing sentiment from Voltaire. To This Day Project – Not goth, but quite worthwhile; a video about confronting bullying. Spooky Bat Pegs – Clothespins with bat wings. I saw these as a prototype a few years ago; I’m glad a manufacturer is finally making them. LED Crystal Earrings – Neat little light-up earrings. Hitchhiking Ghosts Papercraft – Really nice paper “quilt” featuring the Haunted Mansion ghosts. Just look at this gorgeous thing. It’s called a Metallic Tarantula, and is found in only a small area of India. The species is highly prized by collectors, and it’s easy to see why. The photo is from the blog Kodune eksootika, which Google Translate is telling me is Estonian for either “homemade exotics” or “exotics at home” (that latter seems slightly more likely). From what I can gather, it’s following the blogger’s excursion into tarantula ownership. There are only a few posts, but they contain loads of gorgeous photos. Tarantulas make lovely, low-maintenance pets. They’re quiet, clean, and don’t take up much space. New World species (such as the Chilean Rose and Mexican Redleg) are docile enough to be handled, and they’re all fascinating to watch. A couple of drawbacks are that they are wild animals and can tend to be, y’know, bitey; many species throw tiny irritating hairs when they feel threatened; and some can live up to 30 years so there’s definitely a time commitment involved. There are plenty of resources to help you explore whether tarantula ownership is right for you: Cornell University’s Spider Outreach program has some good tips (plus dynamite commentary like, “This is only a species to get if you feel calm about dealing with a fast spider that will eventually run up your arm.”), and tarantulas.com and Tarantula Guide are sites dedicated to tarantulas as pets. 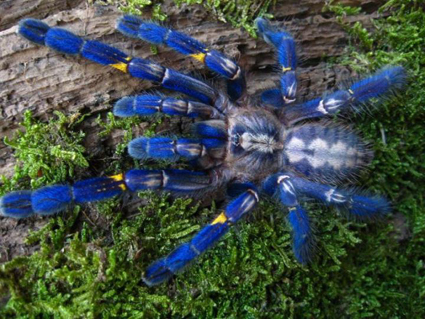 Sure, dogs can do tricks and cats are snugglier, but neither of them have electric-blue fur and you never have to change a tarantula’s litterbox, take it for a walk in the rain, listen to it bark all night, or worry about it scratching the furniture. If you’re ready to care for a live thing only slightly more complicated than a houseplant, tarantulas are an excellent option. Intrepid reader Sally pointed me in the direction of a new series for kids in the the 10-and-up range. Tales from Lovecraft Middle School follows the adventures of seventh-grader Robert Arthur as he discovers that his new school is somewhat…unusual. Robert has discovered that two of his classmates are actually sinister snake-women in disguise. Even worse, his new middle school is full of “gates” to a terrifying alternate dimension – a haunted mansion full of strange spirits and monstrous beasts. Other books released so far are Teacher’s Pest (student council president is actually a bug-monster) and Substitute Creature (a mysterious substitute teacher may have “a sinister secret”). The overall plotline sounds as though it was ripped directly from the first season of Buffy the Vampire Slayer, but these look like spooky fun for kids who have outgrown Goosebumps but aren’t quite ready for Clive Barker. The books also each have a lenticular cover so the image morphs from “normal” to “monster” and back, which is kind of a neat touch. You may have seen this “eyeball mouth”, since it recently went viral (it’s the tear duct on the side that really sells this). It turns out that this is not a one-off, but instead is the work of Swedish artist Sandra Holmbom and she’s got lots more where that came from. Her blog is a treasure trove of great ideas, for both dramatic “every day” makeup and fairly hideous special effects. She has tutorials for a number of designs, and even the ones with no instructions have enough closeup photographs to make replicating them possible. Some of them are surprisingly simple (like the googly-eye nails; others would definitely take time and patience, but the finished look is a-ma-zing. I particularly like her “hazardous” eye makeup and the puzzle lips; the metallic lips are nicely steampunky, too. More special-effecty stuff includes bullet wounds, exposed muscles, and the surprisingly off-putting moustache-where-the-lips-should-be. Particularly impressive is that she’s self-taught and doesn’t even work with makeup for a living; this is just something she does for fun in her spare time. A lot of her older posts are in Swedish, but the most recent few months also have an English translation. She’s been blogging prolifically since 2008, so there’s a satisfying number of old posts to dig through. If you’re looking for makeup inspiration, be sure to check this out. BoingBoing recently pointed to the German company URB, who specialize in tights and socks that appear to be melting. It’s a neat idea, but the prices are pretty cringe-inducing: $55USD, plus shipping. For that price you could buy a whole lot of liquid latex and roll your own. Liquid latex is available at a lot of party stores around Halloween–it can be used for special-effects makeup like wrinkly skin–and can also be found in a wide range of colors online: LiquidLatex and Liquid-Latex are two sources, but there are plenty of others. The online sites also have guides for using the material, so you can refer to them for the best way to apply the latex to clothing. You can wear the socks/tights and have someone else make the latex drips, but a more convenient way is to stretch them over a piece of PVC pipe (or, in a real pinch, a can of tomatoes) that is the same circumference as whatever part of your leg you want the drips on (thighs/calves/ankles). Brush on a thick layer at the top, then allow extra latex to drip down as far as you want. Set aside to dry, then carefully peel off of the PVC. Distress further with holes and runners as desired. Easy! Much cheaper than buying them premade, and if you somehow manage to ruin them it’s easy to make more. Pop-Culture Gargoyles – When this 15th-Century French chapel was renovated, it got some unexpected new gargoyes. Frogwood Manor – Some fairly elaborate cross-stitch patterns. The Haunted Mansion stretching portraits are my favorite. One Hand in the Grave Boots – Striking “zombie’s gotcher ankles!” design by Iron Fist. The North American House Hippo – This was a Canadian PSA to help teach kids that not everything they see on TV is real. All that it’s done is make me desperately want a house hippo. Octopus Tentacle Hat – This is one arresting chapeau. Sugar Skulls – A couple of gorgeous makeup/costume photos. The Decoration of Houses – Project Gutenberg e-version of Edith Wharton’s 1914 book. 5 People on Etsy Who Are Clearly Serial Killers – Cracked makes a compelling argument. This is the most adorably winsome little octopus I have ever seen and I desperately want a real one so I can cuddle it. Etsy shop Emergent Glassworks creates all kinds of lovely glass jewelry, much of it on the spooky side: Eyeballs and carnivorous plants and mushrooms (or toadstools) and lots and lots of octopi. Octopodes. Octopuce. Whatever. They’re available in an astonishing range of colors, as hairsticks or pendants, and you can even get matching tentacle earrings. The shop isn’t currently accepting custom orders, which is a pity, because I bet they could turn out some fantastic eldritch horrors. Still, the li’l octopi are reasonably Cthulhoid if you squint, and they so clearly want to be friends with you. Oh. Wow. This dress with added spidery goodness is amazing. The mechanical dress prototype was featured at EU Robotics Week in Prague last year. It’s described (sadly, rather vaguely), as “sensoric, servo controlled, mechanic, microcontroller based.” Which means that, despite its apparent intricacy, if you know your way around a servo motor you could probably do something similar. Please feel free to make your own suggestions in the comments! Para Abnormal – Splendidly dark-and-goofy single panel comic. Indexed* – Humor by way of charts, graphs, and similar infographics. A Softer World* – Rather than illustrations, this comic is comprised of photographs with odd, often dark, text. Liō – Pantomime strip involving the adventures of a little boy for whom weird, dark, supernatural stuff is loads of fun. Oglaf! * – NSFW. The setting is kind of a quasi-D&D milieu, with the occasional monster and barbarian warrior and whatnot. Mostly hilariously dirty. Some storylines are multi-page, so keep an eye on the navigation. Basic Instructions – “How-to” advice, amusingly illustrated.